Twittercard content appears when you click on View Summary link on twitter timeline. See below image for that. You can include various media on twittercard following is a example of our slideshare document appearing on twitter. 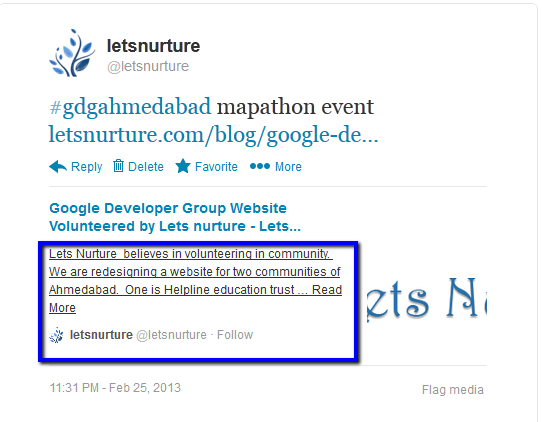 And here is what we got today J Approval of Twittercard for letsnurture’s content. So now our snippet will appear on timeline of everyone who RT/share our tweets. Increase in CRO From Twitter Traffic. Improvisation on Authenticity of Website. Huge Benefit on Inbound Marketing Efforts.